A testament to the ancient empire of Vijayanagara, is a UNESCO world heritage site, Hampi. 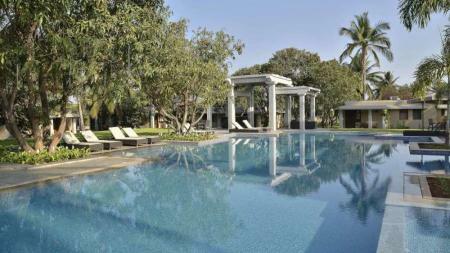 The getaway is adorned with monuments immersed in legends signifying the opulence and grandeur of old times. Surrounded by lush greenery and hidden among ancient giant boulders, Hampi is a sight for sore eyes. 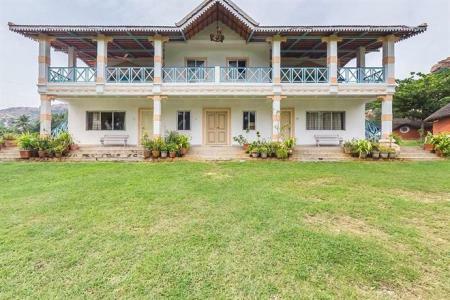 Hampi is also one famous weekend getaway for its wildlife and eco-retreats like the Sloth Bear resort that is frequented by people from all over the world. This historical site that has stood the test of time is a true treat for history and wildlife enthusiasts. There are a number of homestays and luxury resorts that cater to different travelers. Coracle rides cycling Rock climbing, rappelling and Hot air ballooning are activities that the adventurous can enjoy at Hampi. Can't choose between a heriage or wildlife holiday for your next getaway? You don't have to! Head to the Sloth Bear Resort located just 15 kms from Hampi and enjoy the best of both worlds! At a comfortable distance from travel stations and sightseeing spots, Hotel Malligi is the one and only three star property at Hospet. Host a party by the pool or in any of the large conference rooms! 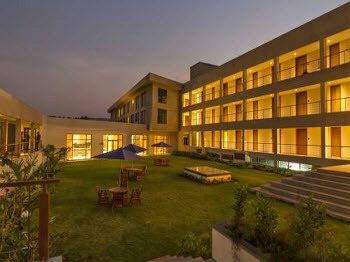 Located amid the lush green ambiance of Vidyanagar Township in the culturally rich state of Karnataka, Hyatt Place Hampi is among the best hotels in Hampi. Spread over 10 acres of land, this upscale, select-service hotel, is ideally designed for the discerning business or leisure traveler. The hotel offers 115 ?smart-design? guestrooms - including seven rooms with private plunge pools and three suites that afford guests a spectacular and unrivalled view of the Sandur Mountain Range, making it the perfect hotel to stay near Hampi. Set amidst a serene valley, Vijayshree Heritage Village with its perfect blend of tradition and culture welcomes you to the magical land of Hampi which transports you back in time to experience the grandeur of the kingdom that existed and flourished. It captures all the romance and splendor of the royal era. The ruins, temples, a landscape adorned with endless stretches of water, greenery and oddly shaped boulders; Hampi is so steeped in history and culture that it's hard not to be awed by its beauty. The Royal Orchid at Hampi , a luxurious hotel equipped with modern amenities and surrounded by the historic and mythological remains makes for a perfect holiday. Situated next to the beautiful Sanapur Lake, this is the perfect getaway from the crowds if you're looking for a peaceful stay. 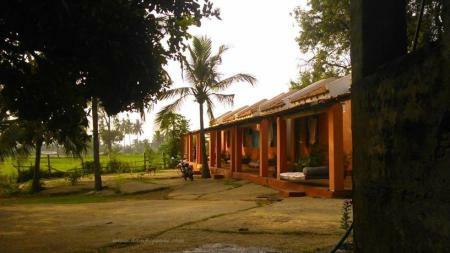 Enjoy the hospitality of the staff and the delicious food here while you explore Hampi. With amenities like a swimming pool, a water park, a beauty centre, a kids club, and massage services, Kishkinda Heritage Resort provides a comfortable and enjoyable stay for all travelers. 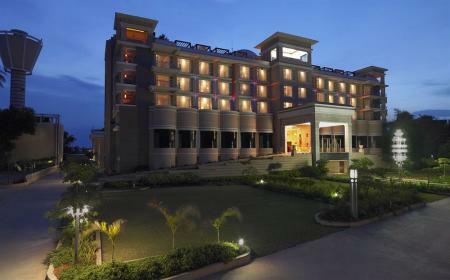 Hampi is full of great inns, hotels and resorts of all kinds - budget, luxury and ultra-luxury. You will be flooded with a variety of choices, and criterion - location, price, amenities, etc. What we have done is list out our top five hotels in the area; limiting in no way, these remain suggestions. Vijayshree Heritage Village: Located by the SH49, the Vijayshree Heritage Village is an amazing 20 acre resort that offers its visitors 43 beautifully furnished independent cottages along with a variety of other amenities - a wellness spa, swimming pool, indoor recreation center, a themed village, and a variety of other trips and activities all planned by the hotel itself. Hotel Malligi: A stylish and modern hotel, the Hotel Malligi is claimed to be the first 5 star hotel in the region. 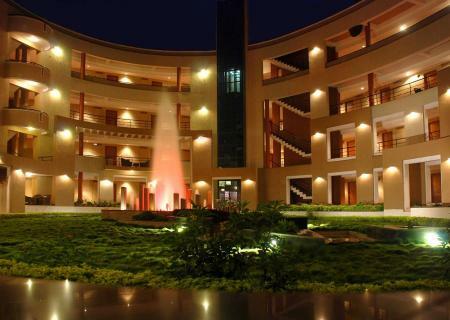 Located in the heart of Hospet, the hotel is famous for its on site spa and dining options (two multi-cuisine restaurants). Kishkinda Resort: The Kishkinda Heritage Resort in Hampi offers its visitors a variety of rooms to spend their vacation in. Enjoy a plethora of outdoor activities - boating, swimming (both indoor and outdoor pool), a great travel desk and more. Heritage Resort: A beautifully designed resort, mirroring the sudden urbanization of the region that still holds onto the historical importance of Vijayanagara architecture, the Heritage Resort is surrounded by orchards of custard apples and mangoes of every variety and is a great place to spend your time in Hampi. Just 6km from the Hampi ruins, the hotel is famous for its specialist spa and hands-on travel desk - that not only creates schedules to the obvious "must-dos" but also includes romantic private picnics and a tour of local farming practices. The hotel also is fitted with all of the amenities required by a modern traveller - multi-cuisine restaurant, outdoor swimming pool, indoor library, a recreational playroom, conference room and a well stocked bar. Royal Orchid Hotel: A fabulous hotel with over 130 beautifully furnished and decorated rooms, the Royal Orchid Hotel comes in three different room types, a cafe, a multi cuisine restaurant (attached to a great lounge and bar), open air jacuzzi, a swimming pool, a fully-functioning gym and more. 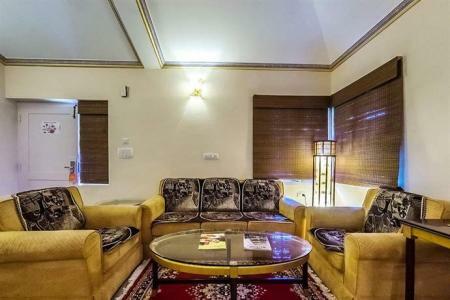 Hampi also offers a plethora of options when it comes to cheap guesthouses that are ideally located. Believe it or not, you can wake up to spectacular views of the river right in front of you, just for a few hundred bucks! Experience utmost hospitality from the comfort of your room, enjoy the convenient locations that place you steps away from Hampi's main attractions - all without burning a hole in your pocket. 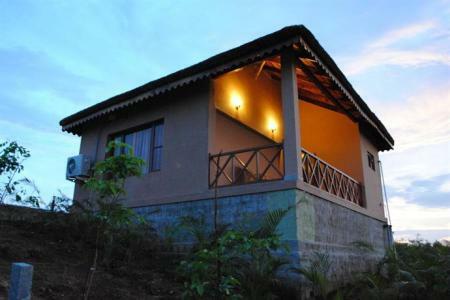 A few such options include Sunny Guesthouse, Archana Guesthouse, etc. By Air: Bengaluru International Airport is your best bet. Located approximately 350km away from Hampi, Bengaluru International Airport is connected to almost all major cities across the world. From here, one will have to either hire a cab, hop on a bus or - if you are brave enough - rent your own vehicle and head down to Hampi which is 7 hours away. 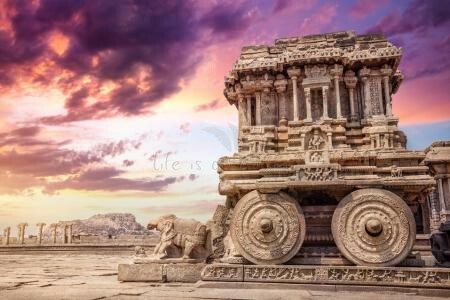 By Road: Hampi remains a great destination to drive to; as the scenery changes - as will the weather - you will find yourself experiencing a rural Karnataka, that revels in its history. Relatively close to south India's major cities - Bangalore (7 hours), Goa (7 hours), Chennai (12 hours) and Hyderabad (8 hours), a day or night trip to Hampi will be worth your while. By Rail: Since Hampi is located within and around the Hospet District, the incoming rail based traffic falls onto Hospet Railway station, 13km from Hampi. From here, one will have to go through the obvious process of hiring a cab or auto, buying bus tickets or renting a car to reach their destination. Hampi is best experienced during the months of October to February; festive months that are both exciting and lenient in terms of the weather. The weather is cooler, with a lot more breeze to help you get through the day. Monsoons (June to August) tend to bring out the scenic beauty of Hampi and are also a good time to visit. The summers, while great for a photo-perfect scenery, leaves you and the land around you dry and taxed. The river is also most likely to be dry during summer months but this makes it easier for you to walk to the other side and experience the laidback Virupapur Gaddi (or Hampi Island). The entire town of Hampi is a tourist landmark, and the best way to explore it, is slowly; taking your time with each area. As such, the two most popular options remain on foot and biking. You can rent a bike from a variety of places in town (or from your hotel) and explore every nook and cranny of this historic town. One can also avail the services of rickshaws, cabs and buses that take you across town, all best reserved for those trips that really require it. If you wish to cross the river and head to Virupapur Gaddi (or Hampi Island), a ferry (that barely charges anything) will take you there. Although a longer route by road is also an option, the ferry will save you a lot of time and money. What Are The Attractions & Things To Do? While Hampi is well-known for its sites and landmarks, which we have listed below, it is important to note the exciting possibility of having an adrenaline fuelled trip as well - courtesy of the adventure sports available in the region - rock climbing, mountain biking, trekking/hiking, body surfing, kayaking, cliff diving and more. Find a local adventure outfit and get out. Vittala Temple: The focal point of Hampi's attractions, the Vittala temple is an expansive, intricately carved, warm-stoned landmark that will leave you in awe, at the handiwork and craftsmanship of the stonecutters of yore. A temple dedicated to one of Lord Vishnu's incarnations - Vital - the temple is not just a historical heritage site, but an active (and powerful) spiritual one as well. Built in the early 15th century A.D the temple has seen kings and emperors come and go, and not a day has gone by where its beauty has moved on too. The most unique aspect of this structure though, are its musical pillars; pillars that emit an audible tone - tuned to a scale - when tapped; used probably for bhajans and other musical events in the temple. The Vittala Temple is a must for everyone - history enthusiast or otherwise. Ugra Narasimha: Carved out of a single, large block of stone, the statue of Agra Narasimha is a major tourist attraction in Hampi. A juggernaut - 6.7m in height - the statue is placed within a small temple complex, situated on the topmost point of the Hemkunt Hill range. Elephant Stable: One of the most preserved structures in Hampi - having survived the Mughal raid in the 16th century A.D - the Elephant Stable is a magnificent edifice that to this day, captures the minds of children and historians alike. An elaborate and intricately designed structure, we know that this building housed the royal elephants of the Vijayanagara Empire. The Elephant Stable is as sturdy and magnificent as the elephants it housed over 600 years ago. Monolith Bull: A statue dedicated to Lord Shiva's mount - Nandi - the Monolith Bull is locally known as Yeduru Basavanna. Situated on the eastern face of the Virupaksha Bazaar, on an elevated pavilion, the Monolith Bull is a junction to a variety of other important landmarks and sites in the area, such as the Kodanda Rama Temple, or the Achyut Raya's Temple. Queen's Bath: Built for the women of the royal family of the Vijayanagara Empire, over 500 years ago, the Queen's Bath (as it is known now) is an impressive 30 sq.m structure with a 15 sq.m pool in the center of it. Built in an amalgam of Indo-Islamic architecture, the bath remains a culmination of the Vijayanagara architectural and engineering pursuits. While a large chunk of what used to be the bath - intricate carvings, beautiful stucco walls, magnificent pillars and more - is absent (credits to the Mughal Empire's constant raids), the bath still holds onto your imagination. Stepped Tank: A large water reservoir - famous for its terraced design and fine blocks of black schist stone, that make it different from all other buildings in Hampi - the Stepped Tank is located off the SH 131 and is within a large campus called the Royal Enclosure. The tank along with the neighboring Queen's Bath and other water reservoirs and tanks are fed by the intricate water system - drains and aqueducts - built in the time of the Vijayanagara Empire, and still functioning today. Dasara Dibba: A large stone platform within the Royal Enclosure, the Dasara Dibba was built by King Krishnadevaraya in the 15th century A.D to commemorate one of his many military victories. One of the highest points in the region, overlooking everything that fell within the empire, the Dasara Dibba is a wondrous structure, and a must for all visitors. Virupaksha Temple: A temple dedicated to Virupaksha - a form of the Lord Shiva - the Virupaksha Temple was built as another commemorative edifice to the king's conquests and achievements. The temple is still functional and has thousands of visitors (both local and foreign) every year. Lotus Mahal: Situated within the Zenana Enclosure (an enclosure in which most of the buildings were devoted to the women of the royal family of the Vijayanagara Empire), the Lotus Mahal is a magnificent structure, whose design is similar to a lotus flower (and so its name). Also called the Kamal Mahal or the Chitragani Mahal, this structure - tall and delicately engraved - is surrounded by large green gardens and is a great place to head down for a picnic with the family. Another unique aspect of this edifice is that it is one of the few completely surviving structures in the area; only weathered by the passage of time and changing climates. Underground Temple: Probably the most weird structure in the group of monuments, the Underground Temple is a Shiva temple built many meters below ground level - which over the years have slowly been filled with water, blocking certain sections of the temple. With large green lawns surrounding the site, the temple is located by the SH131 and is a must. Matanga Hill: The highest point in Hampi, the Matanga Hill is the best vantage point for all of Hampi. A great place to spend time in with family, friends or just your significant other, the hill is special for two reasons - a daily, amazing sunset and the Veerabhadra Temple on its SE perch. Its location (south of the Tungabhadra and to the east of the town) makes it perfect for a hike and the trails there - connecting other important sites and landmarks in the area - ensure it is. Tungabhadra River: One of India's sacred rivers, the Tungabhadra traces through three South Indian states - Karnataka, Andhra Pradesh and now Telangana. Sacred and spiritually important, the Tungabhadra is a beautiful river that must be seen. Daroji Bear Sanctuary: A one-of-a-kind sanctuary, the Daroji Bear Sanctuary is the only place in India where one can view the black Sloth Bear (endemic to India). With a network of caves, and a variety of bio-diverse hotspots, one can enjoy a day outing here, viewing all kinds of bird and animal species native and migratory to this land. Akka Tangi Gudda: The "Sister Stones", or the Akka Tangi Gudda are two large rocks leaning on one another just by the main road on the way to the Underground Temple. While there isn't much to do, it is a grand natural structure that one must see. Hampi also has a hidden secret for those who wish to kick back after a long week, enjoy good food, and meet new people from around the world. A popular hippie destination, Virupapur Gaddi, or more commonly, "Hampi Island", is quite unlike the historical side of Hampi and has its own unique offerings. A small peninsular village across the river, accessible by motorboat ride, or if you are feeling rustic, via a coracle, Virupapur is a backpacker's paradise - full of lush greenery, expansive red rock and few landmarks/sites, allowing you to explore to your heart's content. Filled with plenty of budget inns and homestays, laid back cafes, cheap yet wholesome restaurants and more, Hampi Island promises a good time.